"Barça” / FC Barcelona doesn’t need any introduction; Camp Nou is the home stadium of FC Barcelona. With a whopping number of nearly 100K seating capacity, Camp Nou is the largest stadium of not only Spain, but the in the whole of Europe. Even if you are not a big football fan, you will be surprised to visit the stadium. With a long tradition and a plaid history, Camp Nou & FC Barcelona has become the identity of the Catalans!. As the locals say: Barça is definitely "more than a club!" ("Més que un club"). The ticket for the Camp Nou Experience includes admission to the museum, the impressive Camp Nou football stadium and the interactive zone, where you can experience the most beautiful moments of FC Barcelona. The audio guide (available in many languages) gives you a tour of the stadium and the FC Barcelona Museum at your own pace. You will see everything at this tour in the FC Barcelona stadium: the changing rooms, the players' tunnel, the press room, commentator boxes and of course the Camp Nou museum with all the big FC Barcelona prizes..etc. The club has won five times the Champions League, 27 times the national cup and 23 times the national championship. During the guided tour you will walk a fixed route through the stadium at your own pace and you will have the opportunity to take a photo with your favourite Barcelona players ((photoshop-ed😌). The overall, walk tour will take an hour and a half hours. 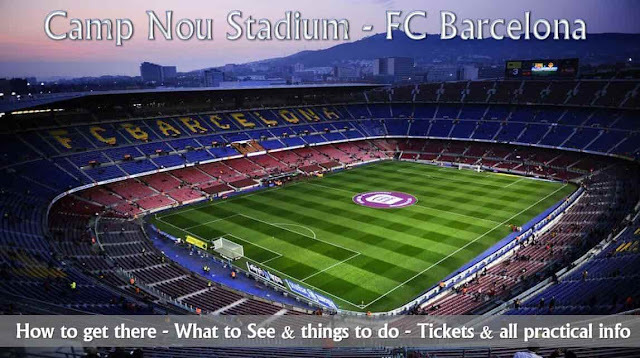 Below video gives you an overview of the The Camp Nou Experience - FC Barcelona Tour. Public transport: Palau Reial (Green Line #3) is the nearest metro stop; From this metro stop you can walk down the street 'Carrer de Marti i Franques'. After 500 meters you will automatically enter the entrance to the Camp Nou Experience. Opening hours : Opens everyday all through the year; however, you must check the opening hours at fcbarcelona.com to avoid disappointments. On the day of a competition, only the museum is often open and a stadium tour cannot be taken!. Price & tickets tour: Basic tour (Tour of Camp Nou & Barça Museum) starts at from 26€; different other tours such as Barça Virtual Experience, Walk along the pitch, Guided visit, Audio-guide…etc are possible. Check all the prices here and always buy tickets from official website to get 3.5€ discount and to avoid long queues.